Just about this time of the year, in Hong Kong one begins to anticipate the new crop of Lychee. The sweet, almost rose scented flavour of fresh lychee, for me, is a harbinger of summer–a time for slowing down a bit, for refreshing oneself in the sea, for drinking cocktails on the veranda of some gentrified colonial building or in a modern rooftop garden. 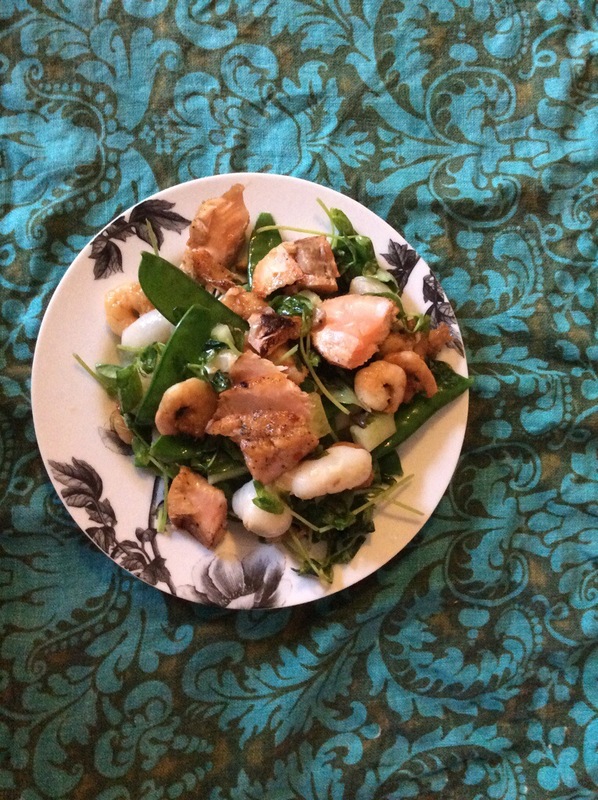 Lychees can be made into drinks, eaten just as they are, or, as I liked to eat them, tossed into this salmon salad. To make the salad, make a marinade of about a half cup of fish sauce, a chopped chilli, and a teaspoon of unrefined cane sugar. Put two salmon steaks in and coat. Set aside for ten minutes or so. While the salmon is marinating blanch some mange tout in boiling water for about a minute then refresh in cold water. Put in a salad bowl. Add about 10-15 lychees that have been pealed and and seeded (if you live in a part of the world that doesn’t have lychees for sale–as I do now–tinned ones can be substituted). Add some greens, I like pea shoots, which are a nod to the seasonality of the lychees. Cut about 3 inches of cucumber into small chunks and add. Also throw in a hand full of torn basil and mint leaves. Toss with the juice of a lime. In a hot frying pan add some sesame oil. Cook your salmon until just done. You can also add some shrimp if you like as I did here. Once cooked remove the skin and cut into chunks. Arrange the salad on the plates and then place the salmon on the top. A perfect early summer meal. This entry was posted in Food, Hong Kong, Recipe and tagged food, Hong Kong, lychee, recipe, salad, salmon, seasonality, summer by geofoodie. Bookmark the permalink. where to get canned lychees in Sheffield ? I have found them at sainsbury’s. No luck at Waitrose.